I strongly believe in taking ownership of our lives. We grow up being led by other people’s thoughts about what our life should look like. We eat and drink when we’re told to. We go where we’re told to. We learn what we’re told to, at a pace that is not our own to decide. We create a life that is based on the many constraints and thoughts that we’ve been exposed to growing up. Yet, as adults, as grown-ups, we have now more than ever the option to choose what our life should look like. And we should seize it! Do you know what you want your life to look like? It’s a question that I personally only started to ask myself when I started on this health path in 2013. I wasn’t really bothered about it before. I was just “going with the flow”, taking the next logical step that was offered to me, without ever asking myself if that was what I really wanted to do. And as you might know already, if you read my story, that lead me to experience many health issues. I ended up being burnt out, with a diagnosis of endometriosis and infertility, and finding myself having to rethink what I wanted out of life. As a result, I ended up changing career – and I am now very grateful for all my life challenges, for they brought me to where I am today! So today, in this post, I want to invite you to put some thoughts into the future you want to create and create a vision board to celebrate it! Now, to be clear, vision boards are just one of the many tools we can use to get clear and visualize that future you’ve put some thoughts into and wish to create. Initially, vision boards have been conceived as a collection of pictures, handwritten notes, magazine cut-outs, or illustrations representing your goals, personally decorated on a board and hung on a wall where you can easily see it every day. In that way, you get reminded every day too about the future you are looking to create, and can purposefully take action to create it. In today’s age, you can also consider creating a digital vision board. 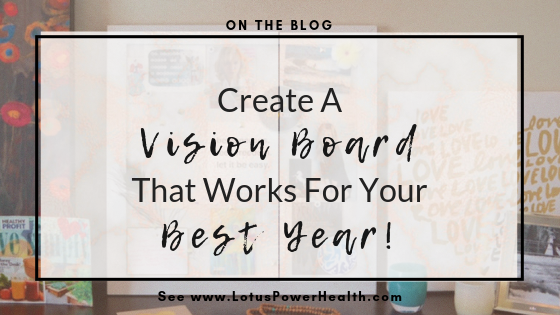 Personally I love the idea of creating a digital board, because it gives you the opportunity to have your vision board evolve with you throughout the year, and to keep it with you at all times (as a printed picture, or as a screensaver for example). Your vision board serves as a guide to lead you towards your dreams. It is a very powerful tool that is used by many who celebrate the laws of attraction. Why should you make a vision board? In your desire to turn your dreams into reality, the vision board serves as a means to invite positive energy in and motivates you towards your goals. When you have a visual representation of your intentions, you are less likely to forget them. Keeping them bottled up in your head will not help you mold them into reality. At the same time, the more you integrate your goals into your life, the less you will have to remind yourself of what they are, making your subconscious work for you in this matter! Creating a vision board may scare you if you feel you aren’t artistic enough to pull it off. Yet, the beautiful thing about vision boards is that there are no rules and you can dress it up or down as much as you like. Some people use glitter and paint and wild pops of color while others take the minimalist approach. It is entirely up to you! What makes you happy? What are your specific goals for the aspects of your life from relationships, career, health, studies, and so on? Where do you envision yourself in 5 years from now? In 10? Do you have bucket list of destinations you want to explore? Have you always wanted to get a pixie cut but was too scared to make such a drastic change after wearing your hair past your shoulders for most of your life? Do you want to learn a new language? Do you want to start your own cupcake business? Do you want to find love? If you’re not sure where to start, I invite you to download the Life Audit Workbook that you’ll find in the Lotus Power Health Academia. The clearer you are about the future you want to create, the easier it will be for you to create your vision board. A cork board is ideal, but any poster board will do. You’ll also need some generic arts and craft materials like scissors, glue, tape, push pins, colored markers, paint, and colored paper. Cut pictures and quotes from old magazines or find some images online and print them out. Personally, I love to use screen shots of the pictures I’ve saved on Pinterest, in my custom year Vision Board. You can see here my 2018 Vision Board, and my 2019 Vision Board. Print out an image of that haircut you’ve wanted to try out. Take it up a notch by pasting the haircut on a photo of yourself to get you to envision what you would look like. Find photos of all those beautiful beaches and museums you want to visit someday. Write out words in the language you hope to learn soon. If you’re looking to be more active, create a picture of you in fitness clothes. If you’re looking to get pregnant, find a picture of a pregnant woman you resonate with, and paste your head on it. A vision board is really a place where you can express all your wishes and desires. Don’t judge yourself as you’re going through the process and have fun. You can also share this with friends and do it an evening together. Go through your images, motivational quotes or phrases and put them on your board. Be sure to avoid images or quotes that have an opposite or negative effect from your goal. You don’t want them ruining your day. Arrange your images and quotes any way you like. When adding words to your board, be mindful about having positive sentences only, as your mind doesn’t grasp the negative ones. Let’s take an example, if you have “don’t sit so much” on your board, what does your mind imagine? Whereas if you had “move more” your mind will take a more proactive approach to get you there. Vision boards are a visual reminder of what you want to achieve in life so make sure it is visible! Find a spot in your home that you pass by every day. You could place it next to your bed, so it is the first thing you see in the morning and last thing you look at before going to bed. Put in your kitchen so you can gaze at it while you have breakfast. Place it on the wall that leads to your door, so you can have a moment to look at it every day before you leave for work. No matter how busy you are, take the time to look at your vision board daily. The more you visually see your goals, the more likely you will be to take action to make them happen. What if I told you that no dream is too big and no goal is too intimidating? What if you knew you were unstoppable, thanks to one simple strategy? It’s true. Your biggest dreams are well within your reach, if you know the steps to achieve them – and those steps begin with your vision board. But not just any vision board will do. Too many people excitedly create a vision board, only to let it collect dust while their dreams take a back seat to the reality of day-to-day life. That’s why I’ve created my brand-new vision board course. Inside, I’ve dug deep into the power of vision boards, including why they work, and how to use yours to finally achieve your biggest dreams. It’s 4 modules chock full of actionable steps you can use to go from “dreamer” to “doer” to incredible success—not only in your business, but in life, too. Will you join me? Make Your Vision Board Work For You! Even if you’ve used a vision board in the past, you’ll find some new ideas and techniques inside that will help you finally turn your dreams into workable plans and long-term success. I can’t wait to see you on the inside. Get all the details right here: Make Your Vision Board Work For You!